I just started watching One Piece about a week ago and I have to say its completely awesome. I've held off on checking it out for years because of its large number of eps but thanks to the likes of youtube, I've been able to watch all of it so far (up to ep 132) by simply streaming it. This anime is definitely shounen at it's best imo, and far out ranks the two other contendors of most popular right now being naruto and bleach. Simply, if you dont like this show, theres something seriously wrong with you. I havent been this into an anime in a long time... or even had the will power to watch 100+ eps in such a short time span and still keep up such a pace. 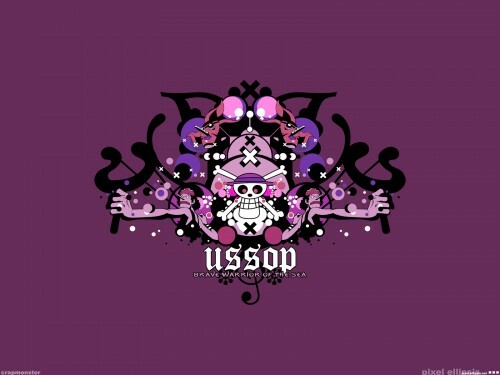 So out of my new love for One Piece, and specifically the awesomeness that is Ussop, I made a quick wall for it. It is somewhat inspired by the video for Gnarls Barkley "Crazy" but I think it turned out more like a bad modern T-shirt design. Anyways, if you saw the video in question youll probably get the whole symmetry thing I have going on, otherwise hopefully it still looks cool. The X marks throughout is a reference to the Alabasta Arc where it sorta symbolized the strong friendship shared between the Strawhat Pirates and Vivi. Circles are simply there because they are easy to work with and the middle skull & bones is the mark of the Strawhats Pirates. Finally, as for the color scheme, I dont really know why I chose a Purplish/Pinkish scheme for Ussop as its probably not very fitting at all. That is a funky design. It would look great on a T-shirt. Quote by eunasahngThat is a funky design. It would look great on a T-shirt. I totally agree. I can see this as a shirt I would end up buying....very similar in style to things at PacSun or any othe skater/surf shop around. Simplistic but not simple, clean and elegant in a new west coast style. Very nice. My admiration for you only grows as i see you evolve as an artist. Once piece love XD Wah...so eye popping. Everything works well together, & the symmetry is quite effective. Quote by crapmonsterI just started watching One Piece about a week ago and I have to say its completely awesome. This anime is definitely shounen at it's best imo, and far out ranks the two other contendors of most popular right now being naruto and bleach. Simply, if you dont like this show, theres something seriously wrong with you. Though Ussop really get on my nerves sometimes. I didn't see the video reference you was talking about sadly. But I like the wall anyway. There's good reference to the series in it and a nice simple design. man! deserves to be my desktop wallie! Oh man, that suits Usopp's character so well. Love it! he will be .. someday ! i wish i cud be alive to see his dream ; becomes true ;'( ! Great wallpaper. Colors look especially good and it's Usopp, so thank you. awesome! loving it, thanks alot !